Owing to our rich industry experience, we are offering a wide range of Oxygen N2O Manifold System. Owing to its peak performance, these products are highly demanded by the customers on a large number of scale. Developed using excellent quality raw material, procured from the latest tools & technology at our capacious infrastructure. All our products are quality tested, before delivering it to the clients end. Further, we also provide these products as per the demands and requirements of the patrons. Our company caters to a wide market for Oxygen N2O Manifold System. The offered range is expendable and non-expendable type with the choice of size of cylinders bank for bulk 'D' type jumbo cylinders. All our products are widely suitable to withstand a working pressure of 1.40Kg/cm2. For the comfort of the patrons, our range also have brass non-return valves for individual cylinders. 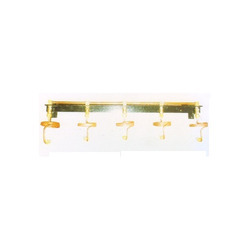 We are instrumental in offering a wide range of Oxygen N2O Manifold System. 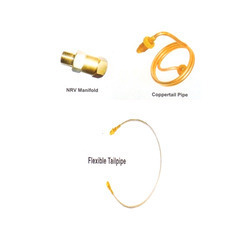 These products have high pressure copper annealed tail pipes with one end having brass adapter, ideally suitable for cylinders. All our products are quality tested on different parameters to ensure their high efficiency. Patrons can also avail these products as per their requirements and specifications provided by them.